On the night of December 2-3 1984 S.L. Kushwaha (45) a teacher woke up at 1.30 on hearing his wife Triveni (36) vomiting. Soon he and his children also began coughing, feeling chest pain, burning in the eyes and suffocation. Looking out of their home they saw people fleeing in panic. One of them told Kushwaha of the gas leak in the Union Carbide Factory about a mile away. They decided to join the crowd and run when Triveni suggested “Why not start doing Agnihotra?” They did, and within 20 minutes the symptoms of MIC gas poisoning went away. 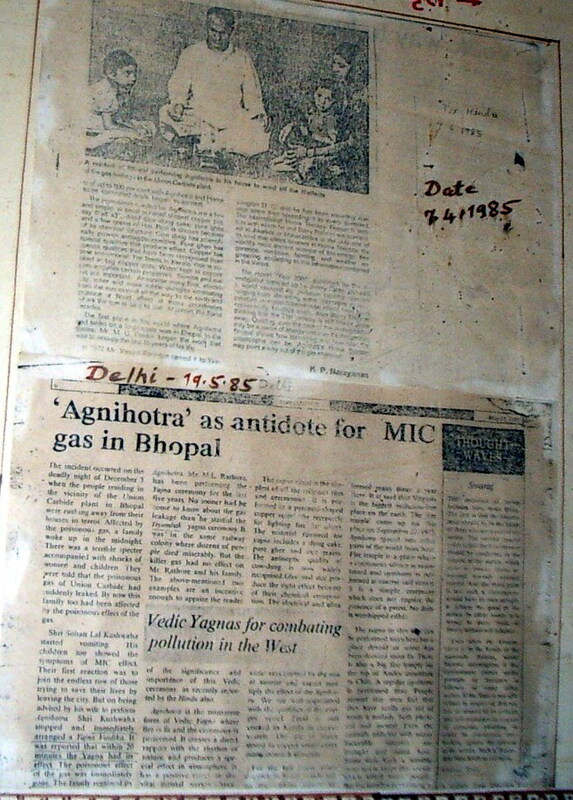 These are but two examples of Agnihotra coming to the rescue of the gas stricken people of Bhopal. Efforts are on to find out how many of the Agnihotris were benefited by the homa in Bhopal. The positive effects of Agnihotra benefited lots of gas affected people and among them the experience of the Prajapati family stands out as the most outstanding one. Shri O.N. Prajapati’s wife was severely affected and was in a very critical condition. Shri Prajapati himself suffered severe irritation and redness of the eyes. His two sons were also badly affected. In such circumstances he started performance of Agnihotra. Favourable result was inevitable. He himself got cured in a week’s time. His wife, however, took months to get fully cured. One of his sons, who was 13 years old, was diagnosed to be suffering from TB (Tuberculosis). Shri Prajapati having himself experienced the astonishing curing power of Agnihotra did not opt for treatment of his son under any other prevalent pathy’s but preferred Agnihotra chikitsa (treatment). His son was completely cured due to the positive effects of Agnihotra atmosphere, Mahamrityunjay Yagnya and regular use of Agnihotra ash as medicine. The most astonishing thing is that Shri Prajapati’s youngest daughter, who was born one year after the gas tragedy, is the healthiest among his five children.